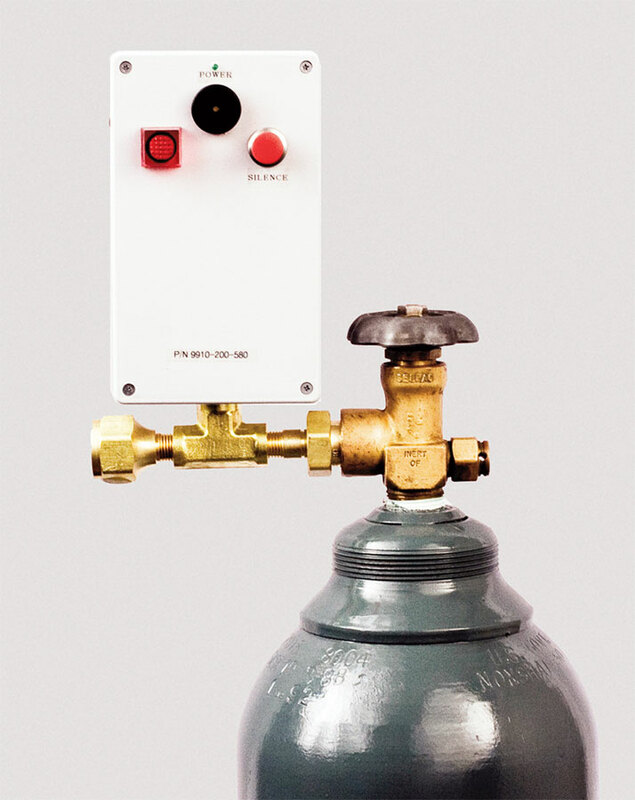 The Series 9900 complies with the requirements of NFPA 99 2002 paragraph 5.1.10.5.5 that mandates the continuous monitoring of purge gas while welding or brazing gas lines. These alarms are ideal for any gas application where a decrease in gas pressure could be detrimental to the operation. Rated for 3000 psig the Series 9900 can be installed between the cylinder valve and the user’s pressure regulator or system. At low pressure, the Series 9900 provides both and audible and visual alert to the user when the container pressure reaches the pre-set level. Units are available in brass or stainless steel with the appropriate CGA connections for easy installation between an existing cylinder and regulator, or with pipe threads or compression fittings for permanent installation into a gas supply system. Standard models require 110 VAC power. For remote locations or where power is not readily available there are battery-powered models that operate on a standard 9V battery. Wide range of alarm pressure selection. Available with CGA connections or 1/4” NPT female inlet and outlet. Complies with the requirements of NFPA 99 2002 paragraph 5.1.10.5.5. Choice of power source – 110 VAC, 9V battery. Provides both an audio (~90 dB @ 10 feet) and a visual alarm. Mating inlet and outlet connections. (Replace the PSI in P/N with the desired activation pressure).